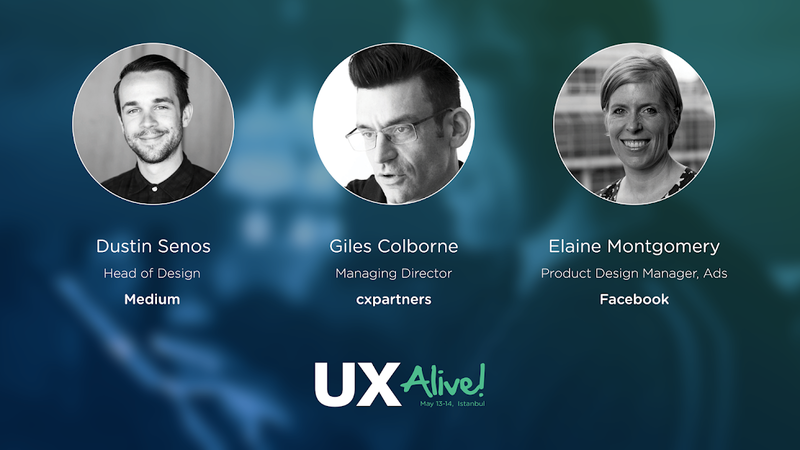 In a couple weeks, great minds will gather in Istanbul for UX Alive, one of the largest user experience and usability conferences in Europe. The cadre of keynote speakers includes top-notch domestic players like Aras Bilgen (CicekSepeti) and Gökhan Besen (Hepsiburada.com), as well as international arrivals like Dustin Senos (Medium), Giles Colborne (cxpartners) and Elaine Montgomery (Facebook). I’m looking forward to seeing what sort of inspiration these designers, makers, and technical, creative folks from around the world will draw from their host city. As they discuss topics ranging from product marketing to storytelling to interaction design, I hope they take the opportunity to see how these topics come into play in Istanbul—how the architecture of the city surprises and delights, how even the most change-averse find themselves opting-in to Turkish street food, how old Ottoman traditions are rebranding themselves for today’s market, and how the city tells its own story—and sometimes, yours—through the calls of its vendors and fortune-telling bunnies. Istanbul might not follow the usual set of heuristics, or offer an intuitive interface. But its tourist satisfaction ratings run high, and that’s a metric you can trust. In earlier days, a haunt for nosy mothers to scope out potential brides for their sons, a hamam is one of Turkey’s quintessential experiences. Hamams in Istanbul are plentiful (you can check out Atdaa’s curated list here), and each one offers a slightly different setting and service. In general, you can expect to wrap yourself up in a peştemal, and spend several hours in a dreamlike state of relaxation as you move from the ılıklık (warm room) to the sıcaklık (hot room) where you’ll spend some time dozing off on a heated marble stone and enjoy the benefits of optimal service design as an attendant arrives to give you a massage and a scrub before you head to the soğukluk (cold room) for a cool down. The Ottoman tradition of welcoming guests into one’s home with a few drops of rosewater was soon replaced by the lemon-scented kolonya. 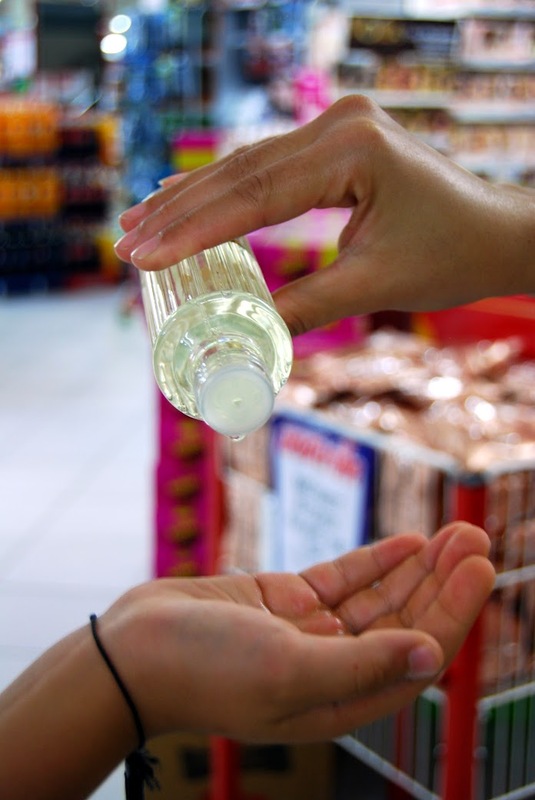 The alcoholic mixture, eau de Cologne, was originally created by an Italian expat in Germany, excited to have found a recipe redolent of his home country’s spring morning air. Nowadays, Turkish children visiting their grandparents cup their palms as their elders pour from a bottle, and restaurants always offer their diners a few packets of kolonyalı mendil (moist towelettes with kolonya) along with the check. Some kolonya makers have updated their marketing strategy to tap into a younger, hip crowd, offering experimental essences like Rebul’s green tea and fig blossom. Take a moment to think about the most upscale nightclub you’ve been to. Then, visualize it on the shores of the Bosphorus, with the glittering Bosphorus bridge and the city lights of the Anatolian shore in the background. Add to that some yachts gently approaching the edges of the club, pausing just long enough to let some VIP guests in through the waterside entrance. 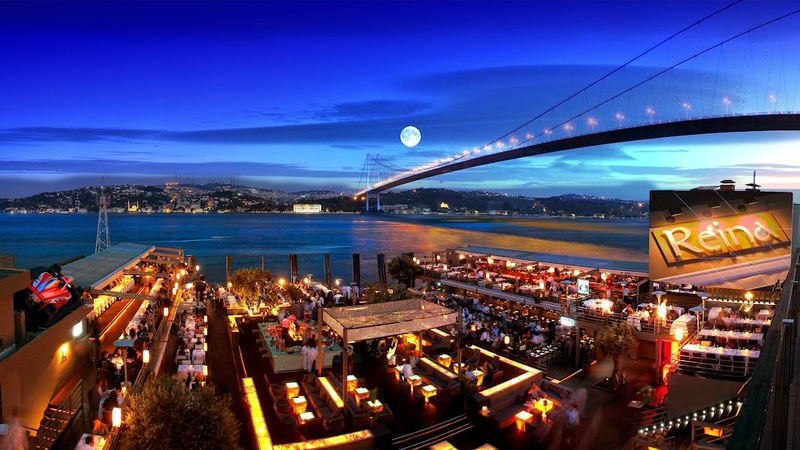 Copy-paste this scene over and over, and you’ll start to get a sense of Istanbul’s exclusive nightlife, known as the Golden Mile on the stretch of waterfront property from Kuruçeşme to Ortaköy. Proven to convert even the most adamant of dive bar enthusiasts. After your night of clubbing, you might get a hankering for pizza, or chicken nuggets, or whatever your drunk food of choice may be. Let go of that craving, and allow your inebriated Turkish friends to lead you to their 4 a.m. meal of choice. Likely, it’s the ıslak hamburger at Kızılkayalar, perhaps at their stand near Taksim Square (literally, “wet hamburger,” the patty drenched in sauce). 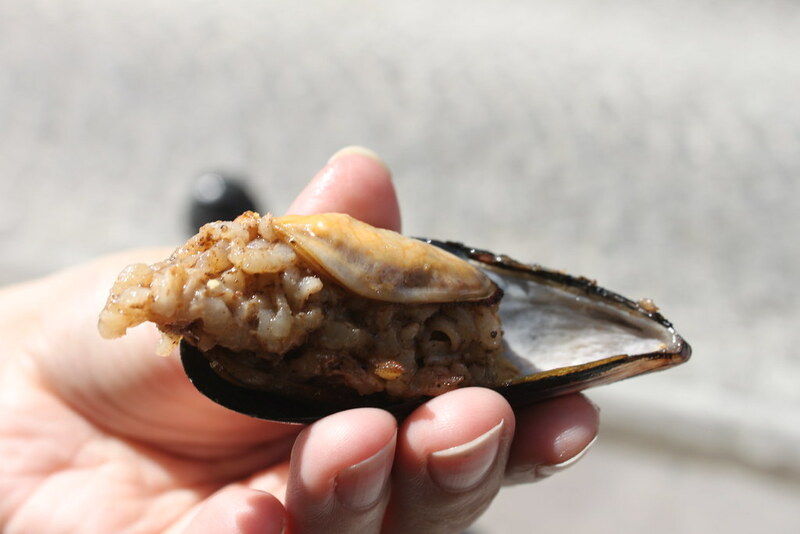 Or, it might be işkembe çorbası (tripe soup), or kebabs, or midye dolma (mussels) with rice stuffing, or kokoreç (intestines). Some of these sound a little out of your comfort zone? Just drink a little more, then try again later. Your preferences will be updated soon, I promise. Also, check out Atdaa's list of "Most Creative Foods of Turkish Cuisine". When traveling outside their city, Istanbulites are often nostalgic for the ferry rides between the European and Anatolian shores. On a ferry ride along the Bosphorus, you’ll see a dreamlike skyline of the mosques and palaces, and watch the seagulls dive in and out as they catch bits of bread tossed out by the passengers. Even if you’re seated indoors, you won’t miss out on the show—chances are that you’re sharing your ferry with one of the city’s creative vendors, who’s about to showcase his great oratory skills to tell you about the deal of a lifetime. The items on sale will vary, from the type of kitchenware you might see on an infomercial (like plastic lemon squeezers that don’t require slicing the lemon), to stationery supplies, toys for children, men’s razors, and anything else that you would never consider buying until you hear just how low the price can go, and just how many items the vendor’s willing to throw in for that price. Add the fact that this will be a cross-continental purchase (and how many of your friends can say they’ve had that experience?) and it’s only a matter of minutes before you raise your hand to call over the charismatic salesman, and tell him that he’s got himself a deal. E-commerce may be efficient, but is it ever this fun? It’s impossible not to notice the stray cats of Istanbul. They are everywhere - lounging on radiators in indoor cafes, squinting in the sunlight at the ferry landings, weaving between your legs at outdoor seafood restaurants, perched on top of trashcans, sleeping outside the glass doors of high-end boutiques. You’d think that considering how ubiquitous cats are, Istanbul residents would be sick and tired of them by now. 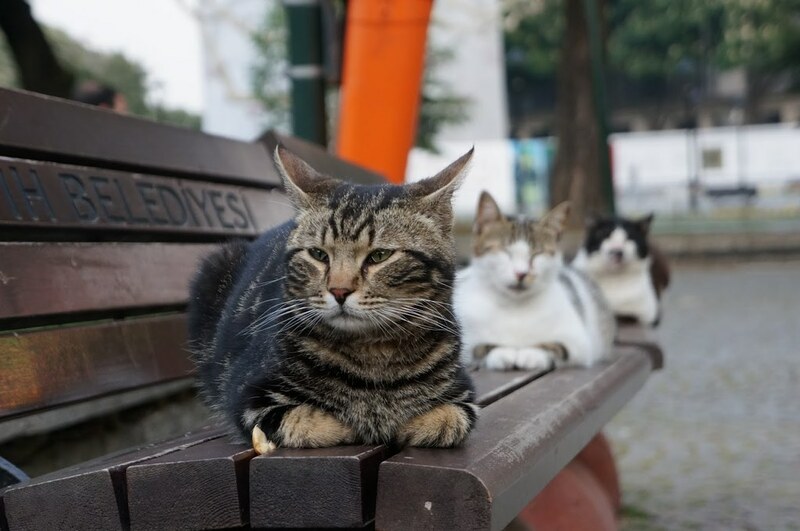 But there is no love quite like the love Istanbulites have for their city cats—in other words, they’re a feature, not a bug. Urbanites pause on the street to coo and pet them, leave out dishes of water in front of their apartment during the hot summer months, and fervently share pledges and petitions on Facebook to take better care of their city’s street animals. If you’re not too fond of felines, I can’t promise that you’ll meet many empathetic Istanbulites. ben geldim gidiyorum / I've come and I am gone from m e T i n a k d e m i r on Vimeo. One can’t talk about the sounds of Istanbul without including the distinctive cries of the traveling salesmen, which are almost, some might say, as romantic as the calls to prayer. In fact, there’s even a beautiful video showcasing all the different voices and rhythms of the city, highlighting its nomadic businessmen. Nothing says winter holidays like the vendor selling tickets for the New Year’s lottery, or early morning like the call of the simitçi with his fresh, sesame-seed bread. Neighborhoods recognize the call of the man who’ll bring round produce, the one with the best watermelon, antiques, cheese, cotton, pastries. All you need to do is yell from your window, or your balcony, and they’ll stop by. Now if that’s not social/local/mobile, I don’t know what is. In Istanbul, one of the ways the culture of storytelling manifests itself is through fortune-telling. You can take a peek into the future via coffee grounds, playing cards, or, our favorite method — cute bunnies. You’ll see the bunnies awaiting their next customer atop painted carts, and their owner will pull out a tray for you lined with grooves holding slips of folded, multi-colored paper. 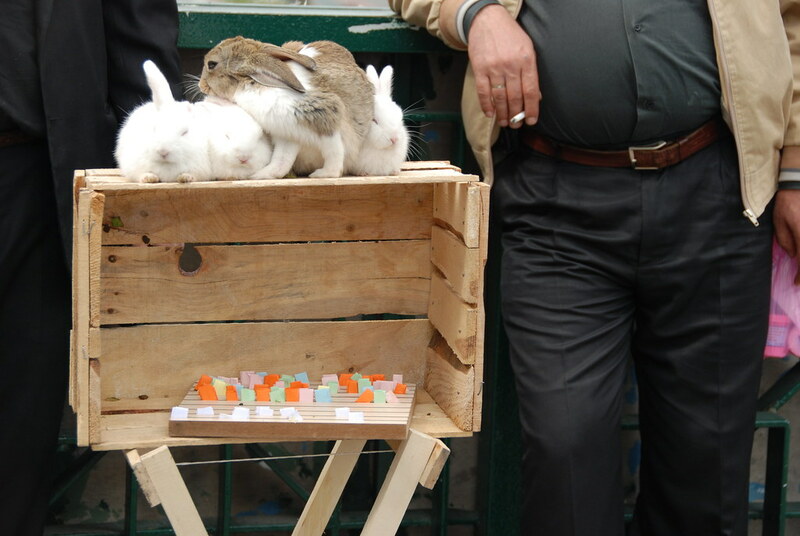 Here’s how it works: the vendor places the tray in front of the bunny, who becomes, as Istanbulite bunnies are apparently wont to do, vastly interested in sniffing among the various fortunes. Once it narrows its focus down to one slip of paper, the vendor will ask you to pull it out, and unfold it to reveal what life has in store for you. When you feel yourself lost in the hustle and chaos of the city, encountering such a personalized experience brings about a welcome sense of peace and calm. 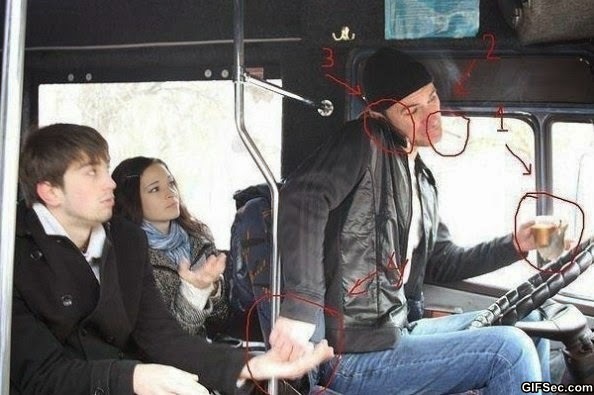 No matter how well your app can multitask, it will never be able to multi-task at the level of a dolmuş driver. These guys drive the white vans that serve as shared taxis with set routes from A to B, and passengers can hop on and off at any point, paying only for the distance they travel. Drivers take the money passed up from passengers (“Two for Kadıköy,” or “Two for the theatre at the end of the road”), calculate the distance, count out and pass back the correct change, and keep track of who hasn’t paid their fair share as passengers go in and out — all while navigating the chaos that is Istanbul traffic, and likely talking on the phone. All personal bias aside, Turkish breakfast is the king of all breakfasts. It arrives as a full spread comprised of many, many small plates. Sour cherry jam, apricot jam, tomatoes, cucumbers, black olives, green olives, feta cheese, kashkaval cheese, tulum cheese, even more cheese, cream, honey, the famous sucuk (Turkish sausage), simit (round sesame bread), and a slew of other food items that I can’t write about right now because this morning in San Francisco I had oatmeal for breakfast and this is becoming quite painful. What I will say is that Turkish breakfast is an excellent metaphor for experiencing Istanbul: A series of small, surprising delights, completely overwhelming, and too much to take in on a single visit. Just as every visitor needs a repeat trip to Istanbul, Turkish breakfast is a meal necessary to experience again and again. Already overwhelmed? Check out this article about the best restaurants for breakfast in Istanbul.